NEWPORT, R.I.- Consider these results from Block Island Race Week: Ten boats, seven races, five different race winners, and the top three undecided until after the last day of racing. The winner finished mid-class twice and the last-placed boat had a fourth in its results. In the new, nearly level-rating IMS 40 Class, it was good, close racing. Dissatisfied with the low turnout of IMS racers on Long Island Sound, Gino Bottino, owner of the Tripp 43 Raven, set about finding other owners with similar boats. 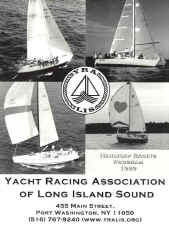 He found Steven Loeb, with a new Tripp 43 Sirena, and Bill Felton with a Tripp 41 Montana, and formed the IMS 40 class. During a midwinter owners' meeting at Stamford YC, the group set the rating band at 558-575 IMS GPH with a length overall of 39 to 43 feet. The owners also agreed to sail under the IMS cruiser/racer Category 1 helmsperson prescription and lumped together the stripped-out racer and cruiser/racer designs. The class has grown to 15 members with boats ranging in age from 5 to 1. In its first season, 27 days of racing are scheduled at nine New England regattas, including the American YC spring and fall series, Block Island Race Week, and their own two-day event in June. The class will award spring, fall, and overall season trophies. "By limiting the number of events that the class attends and working hard with the host clubs and organizations, we've been able to have our own starts in our first year," said Loeb. "And with a set schedule, owners can plan their season. The result is strong attendance and excellent racing, probably the best IMS racing on the East Coast, maybe the country." The racing has become hot enough to attract the attention of non-local boats. Craig Speck's Nelson/Marek 43 Vim 3 from the Great Lakes has joined the class, and V-Max, Fred Pipin's Farr 39ML will be trucked to the sound after the Chicago-Mac Race. "For whatever reason, a major part of the Great Lakes IMS racers decided to buy Farr 40s and race one-design," said Pipin. "This year we're racing with the Farr 40s with duplicate scoring, but it's obvious where the owners' interest is. After watching the IMS 40 Class grow through the website (www.ims40.org) and talking with the organizers, we decided to move the boat east." Other interest in the class is coming from potential owners who are contacting Loeb looking to buy boats that fit within the class restrictions. "The boats in this rating band are all very similar in speed," said Loeb. "Some of the boats are semi-production like the Tripp 41s while others are custom. In all cases the boats allow for an owner's personal tastes unlike one-design classes." NEW SHOREHAM, R.I.-The air was only light to moderate but remarkably free of fog throughout the 18th running of Storm Trysail Club's Block Island Race Week with 223 IMS, one-design, and PHRF racers assembled. Most classes completed seven races. John Thomson's Solution came from behind in the second half of the week to successfully defend its title at the Farr 40 Nationals held in conjunction with Race Week. On Thursday while the other classes raced around the island, the 40s sailed three windward/leewards, and Thomson's 2-1-4 put him three points ahead of Edgar Cato's Hissar, the early leader. Friday's two-race, series finale ended with Hissar pushed back to third and John Ryan's Swordflounder in second after winning the last race. In other action, Isam Kabbani's Farr-designed,CM 60 Rima used four bullets to win the five-boat IMS big-boat class, with Bache Renshaw's N/M 48 Virago in second. In the seven-boat N/M-designed 1D35 group, John Fisher's Jazz won four of eight races to beat Roger & Garth Dennis's Smiling Bulldog by 8 points. Also scoring a big win was Steven Loeb's Tripp 43 Sirena in the 10-boat IMS 40 class that was so competitive half of the boats won individual races. Tripp designs finished well in the IMS 40 class with William Felton's Tripp 41 Montana in second and James Sinclair's Cwene II, also a 41, in third. IMS 40 Association recognized in June 1999 issue of Seahorse . The IMS 40 Association - who said IMS is finished in the US? IMS entries at major inshore events in the US, such as Key West Race Week and the SORC, have stayed relatively static in recent years, showing little significant gain or loss. It seems the number of active IMS players has settled at a little over a dozen, with only a handful being IMS cruiser-racers. Contrast this with five or six years ago, when hundreds of IMS certificates were being issued annually, for all levels of IMS competitors. This drastic decline of IMS popularity has been blamed on everything from poor rule management to measurement complication and expense. Many have been counting down the days to a time when IMS could be declared officially dead in the USA. Yet despite this gloomy forecast, fortunately there is one US group that has not lost sight of the fact that the rule, despite its flaws, still does a better job than any other, and that most of the boats that have been designed and built to it in the past few years are actually a lot of fun to sail. In fact, this group's basis for existence is that it 'believes that the IMS system is the fairest handicap system available today'. It was on this premise that the IMS 40 Association was founded late last year, 'to promote racing among IMS racers and cruiser-racers of similar speeds and sizes'. 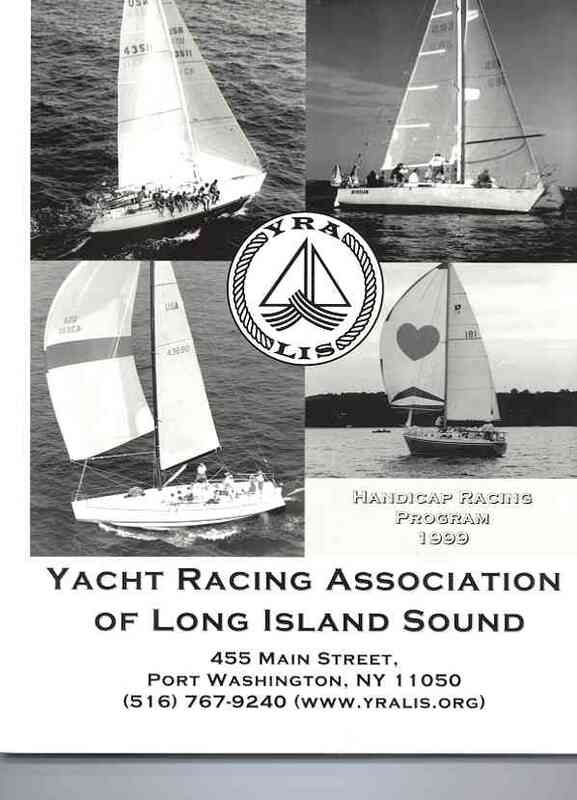 The new organization is based in Long Island Sound and has, for its first year, devised an ambitious calendar of eight regattas, in which most of its current membership of 10 boats will compete. Many of the present members own boats designed by Bill Tripp, including Cwene II, Montana and Morning Glory', all Tripp 41 C-Rs; the two Tripp custom I LC 40s High Noon, owned by Art Conway, and Bob Bayer's More War Stories; and two Tripp 43s, Sirena and Raven. Rounding out the class is Bob Siegel's Farr 43 CR Pax NZL (ex-Georgia), a Farr 40 Swordflounder, and the newest design, Craig Speck's N-M 43 VIM Ill. Out of this group, Vim and Montana have been the only active IMS campaigners outside Long IsIand Sound, so it will be interesting to see their performance relative to the others. In order to qualify for the IMS 40 Association, members must have boats with IMS GP ratings from 558 to 575 sec/mile. In addition, all must abide by US prescriptions to IMS rules, including adhering to CR crew restrictions, which specifies amateur helmsmen, even on the non-C-R yachts. The class has thus also adopted one of the most popular features of the Mumm 30, 1D35 and Farr 40 class rules, to limit the number of professionals aboard while racing, which in this size range means a maximum of three. Will the new IMS 40 Association stimulate the building of some new IMS boats within this size range? Probably not, as the class members seem more interested in keeping the racing keen, but with an emphasis on fun rather than on being too overly competitive. But the great benefit for the owners is the provision of a viable competitive alternative for boats and programmes which would probably not be suited for grand prix-level IMS competition. And, as with the popular one-design fleets, the availability of a good race schedule should help the boats retain reasonable resale value. Newport RI - The Volvo Distance Race marked the mid-way point in the New York Yacht Clubs Race Week at Newport presented by Rolex and provided 77 registrants with a competitive change of pace from the around-the marks racing that began July 18. Starting at the mouth of Newport Harbor in a stiffening 12-14 knot breeze, eight classes of boatsranging from 30-60 feetsailed upwind to Point Judith, downwind to Sakonnet Point, upwind again to a point near Beavertail and finished with a reaching leg back to the harbor. The total distance was just over 38 miles. "It was an interesting counterpoint to the fast-pace, short-leg buoy racing we completed yesterday," said New York Yacht Club Commodore Robert James, who sailed his IMS-rated yacht CARRONADE, a NY4O, to a class third and won one of the seven races held for his class over four days of IMS and PHRF competition. "Newport has delivered on its reputation as an outstanding place to sail," said James. "You just cant beat the great wind and the great sailing we had today." The newly launched SIRENA, a TRIPP 43, won the IMS Cruising class with her owner Steven Loeb of New York, NY, steering. Along for the trip was the boats designer, Bill Tripp of Wilton, CN, who was pleased with the performance as well as Loebs second-place class finish in the race weeks first half. 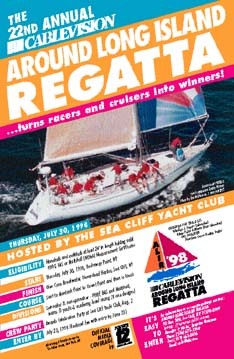 "This was a great idea, the way the New York Yacht Club planned it," said Tripp, referring to the split racing format. "Everyone gets exactly what they want." The trophies that will be presented to Steven Loeb at the 21st annual Around Long Island Regatta awards ceremonies today in Sea Cliff will look familiar, very familiar. He's won them before. Sirena, Loeb's 44-foot sloop, was declared winner of the Cablevision Trophy, the overall prize for the best corrected time in the fleet of 100 boats, and the Thomson Trophy, for the best time -on-time performance. Loeb also finished first in Division 8. Loeb, the overall winner in 1995, became the first skipper to win the regatta's top prize more than once. He also won the Thomson Trophy in 1994 and '95 and is the only multiple winner of that award. Loeb, who lives in Manhattan and keeps his boat in the Bronx, could not be reached yesterday, but George Koppmann, one of Sirena's 11-man crew, was located at the City Island Yacht Club, where Loeb is a member. "It was a beautiful sail," Koppmann said. "I don't; remember any race as nice as this one. We had a good breeze all the way around. The winds were consistent, the water was flat and we made some good decisions." Their best decision was to head for the Connecticut shore when sailing down the Sound. "We had just a bit more wind and a better angle than the boats that stayed on the Long Island shore," he said. The regatta, hosted by the Sea Cliff Yacht Club and sponsored by Cablevision, began Thursday off Rockaway Point in Queens. The course went east to Montauk Point, northwest to Orient Point and west to the finish line off Sea Cliff in Hempstead Harbor. Sirena covered the 200-mile distance in 31� hours and finished just two hours and 25 minutes after Surface Effects, a 50-foot sloop from Annapolis, Md., that was sailed by midshipmen of the U.S. Naval Academy and was the first monohull to finish the race. Surface Effects won Division 11, but after time allowance handicaps, which are based on boat size and potential speed, were computed, Sirena eked out an eight-minute overall victory. Surface Effects dropped to second.